I am delighted to announce that I have a new blog site . I think you will find it a big improvement from my present blog site . It has a lot more resources and articles and I am in the process of categorizing my blogs so it will be easier to find stuff. However one thing that has always intrigued me with political campaigns is that branding and positioning, although planned by political parties, are not always truthful and sometimes rely on old inaccurate stereotypes of a political party and/or their philosophy. For example one of the most popular ones is that Liberals are tax and spenders and Conservatives are great fiscal managers who are very careful about spending. If you ask the public to describe the difference between Liberals and Conservatives, inevitably one of the things they would mention is the issue of spending and taxes based on this stereotype. So as a little experiment, I decided to find out if there is any truth to this notion of Liberals are spenders and Conservatives are “fiscally prudent. Here is what I found. The worst deficit spending in Canadian history is a Conservative legacy, not one of the Liberals according to Steven Pate. The Conservatives have been in power under 2 Prime Ministers in the last three decades. In both cases they showed an alarming record of deficit spending. When Brian Mulroney took office, the Canadian debt (adjusted for inflation) was about $250 billion. In ten years, the Conservatives almost tripled our debt to $630 billion. It took the Liberal government another 12 years to pay down that debt to $500 billion. After a brief respite, the Conservatives are back into deficit spending, with our debt on the rise again. In the past few years, under the Conservatives, the number of public servants has soared, government spending has skyrocketed, and the deficit has bulged. Some of these results – spending and the deficit – are due to the severe recession, to which the government responded, as did governments throughout the Western world. In the USA, most people believe that Democrats are big spenders and that Republicans are tight-fisted. The evidence leads to a very different conclusion. Since 1970, spending has grown 64% faster when a Republican sits in the White House than when a Democrat does. In the twelve years that a Democrat has sat in the White House, spending has increased at an average rate of 1.29% per year; during the 22 years of Republican presidencies, government spending has risen at an average rate of 2.12%. In other words, spending has grown 64% faster when a Republican sits in the White House than when a Democrat does. When Democrats controlled the White House plus both houses of Congress, spending grew at 1.70% per year, slightly below the average growth rate of 1.83% for the entire period. The slowest spending growth occurred when a Democrat sat in the White House and Republicans controlled both houses of Congress. Spending rose by an average of just 0.89% during the six years of this situation, which all occurred with Bill Clinton as president and Newt Gingrich as Speaker of the House. During the 14 years Republicans controlled the White House and Democrats controlled both houses of Congress, spending grew at an average annual rate of 1.92%. During the eight years with a Republican president and a split Congress, spending grew at 2.54% per year. Will the facts, figures, or statistics inform voter’s decisions? I doubt it as people believe what they want to believe and giving them the facts won’t change their mind. Liberals are branded as tax and spenders and Conservatives as great fiscal managers. Just got back from vacation and spent a fair bit of time listening and watching the US news. I have always been a tremendous admirer of the USA. I love their entrepreneurship and as a marketer have always loved the marketing that comes out of the USA. So it with great sadness that I see a great nation losing some of its luster for reasons (i.e. the debt ceiling) that are baffling. Why does a country that produces the greatest business persons, entrepreneurs, scientists, entertainers’ athletes etc. produce such mediocre politicians? While listening to the woes of the USA over the past few weeks it made me think about one of my favourite songs. 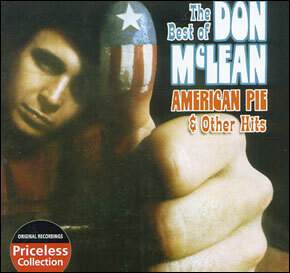 In the autumn of 1971 Don McLean’s American Pie entered our collective consciousness, and many years later remains one of the most discussed popular music ever produced. A cultural event at the peak of its popularity in 1972, it reached the top of the Billboard 100 charts in a matter of weeks, selling more than 3 million copies; and at eight and a half minutes long, this was no mean feat. This was no ordinary song. What set American Pie apart had a lot to do with not totally understanding what the song was about, provoking endless debates over its epic cast of characters. But however open to interpretation the lyrics may have been, the song’s emotional resonance was unmistakable: McLean was clearly relating a defining moment in the American experience—something had been lost, and most Americas at the time knew it. Opening with the death of singer Buddy Holly and ending near the tragic concert at Altamont Motor Speedway, Americans were able to frame the span of years the song is covering—1959 to 1970—as the “10 years that the USA had been on their own.” It is across this decade that the American cultural landscape changed radically, passing from the relative optimism and conformity of the 1950s and early 1960s to the rejection of these values by the various political and social movements of the mid and late 1960s. Sound familiar? Again America is going through a major transformation. I used to think America would solve its problems, after all else failed. Now I’m not so sure. The political class is looking more dysfunctional than ever. You can’t help but be depressed by the game of debt-ceiling chicken being played in Washington. What is really troubling is the impact that the Tea Party has on the country’s politics. For the record I am a strong proponent of people having a voice in politics but there is always a danger when you let a “squeaky wheel” overpower all other opinions. For example almost half of the U.S. federal budget today is accounted for by Medicare, Medicaid and Social Security. If nothing changes, these three programs will consume more than 100 per cent of the U.S. budget in 25 years’ time. PIMCO bond king Bill Gross argues the U.S. situation is actually much worse, when one includes the unfunded liabilities of Social Security ($8 trillion), Medicare ($22.8 trillion) and Medicaid ($35.8 trillion). Silicon Valley venture capitalist Mary Meeker calculated the balance sheet for the U.S. if it was a company, and estimated that USA Inc. presently has a negative net worth of $35 to $40 trillion. I wish my American friends well as they are going through a rough patch and hope sanity and common sense will prevail among their politicians during this very difficult time.